As our client, you can choose from a variety of jewelry options that allow you to express yourself and make a unique statement. You can be confident that every piece of jewelry we offer is of unmatched quality ensuring beauty and durability as well as a better healing experience. Most of our piercing jewelry is made from super durable implant-grade titanium. 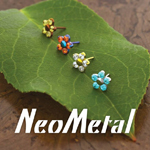 Its great for folks with metal allergies and as a bonus its anodizable to many fun colors to match your personal style. 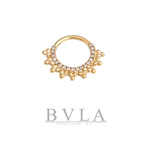 We also offer options in solid 14 karat gold (yellow, rose, and white alloys, all nickel-free). Upgrade to Swarovski Zirconia, lab opals, stone cabochons, and even diamonds or other precious gemstones that are expertly jeweler-set to maximize brilliance. The prices listed below are for reference only. These prices are for the listed common piercing/jewelry combinations. Your actual piercing price will reflect a service charge and the cost of the jewelry of your choosing. Discounts are available for piercings done in multiples. To talk to a representative about all our available options: stop in today! All piercings include an individualized consultation.